Woods at Breckenridge in Breckenridge Real Estate are ski in, gondola out townhomes. 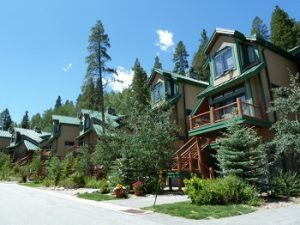 Located in the town of Breckenridge you can easily walk to Main Street from these luxury Breckenridge townhomes. There are a total of 25 townhomes, comprised of 11 – three bedrooms and 14 – four bedroom residences. The properties range in size from 2232 – 2825 square feet, there is one larger townhome at 3867 square feet as well. Woods at Breckenridge was built between 1995 – 1997. Each townhome in Woods at Breckenridge come with a one car garage. Being located across the street from the BreckConnect Gondola is a great location to be able to access the Breckenridge Ski Area to ski or snowboard, walk Main Street to shop or enjoy a meal at one of the 76 restaurants in Breckenridge Colorado. Woods at Breckenridge is where you will find luxury townhomes for sale in Breckenridge CO.
For additional information about properties for sale in the Woods at Breckenridge, for a complete listing of homes, condos, townhomes and Breckenridge CO Real Estate for sale, contact Justin and Krystal Knott with LIV Sotheby’s International Realty.